December 6, 2017 – Sharing the Stage offers their seventeenth show this Friday night at The Royal Room (5000 Rainier Ave S, Seattle, WA 98118). Sharing the Stage is a concert series that pairs professional musicians with student bands as openers. 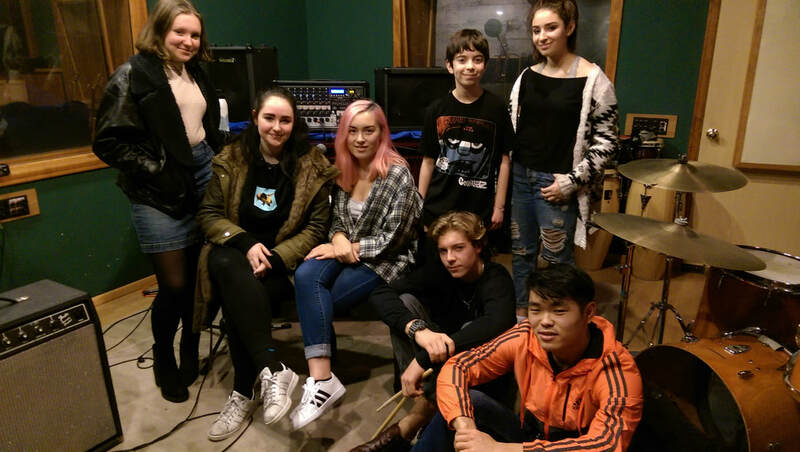 The shows are dynamic, formative experiences for the student musicians, and they are great fun for the headliners and professional crews, as well. Student openers have an amazing opportunity to open for top professionals they listen to, and the professionals have the opportunity to reflect back on themselves when they were students and aspiring musicians, finding their way and finding their voice. Terms and Conditions = Sadie Chaplan ‘18, Jaidyn Lam ‘18, Nick Heymann ‘18, and Chase Habu-Chinn (Bush student). Clara Cimino ‘17, lead singer and songwriter, returns from her freshman year at Western Washington University to perform with the band! Esme DeCoster ’18 designed the poster (see below), Jim Sangster (Lila ’18 and Sam ’23) attended rehearsals as Music Mentor, and SAAS faculty member Amos Miller was Rehearsal Studio Engineer. Friday’s performance will begin at 6 PM. CLICK HERE to purchase tickets. Congratulations to all the student musicians. Good luck on Friday!